This year, there are six different organizations and programs featured in Santa Cruz Gives that focus on issues surrounding homelessness, demonstrating how complex and broad the issue is. Homeless Services Center is proud to be a featured non-profit in this year’s Santa Cruz Gives program, specifically featuring our Recuperative Care Center. On December 4, 2018, the Good Times featured an article about the non-profits working to serve those experiencing homelessness, with an emphasis on Homeless Services Center (HSC) and the Recuperative Care Center. 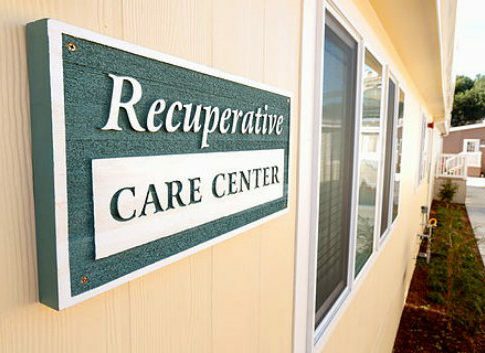 As the article states, the Recuperative Care Center (RCC) is funded by several local healthcare organizations, as well as by community donations. In addition to this critical financial support, the RCC is largely as successful as it is because of the close operational partnership between HSC and Homeless Persons’ Health Project (HPHP), a full service, primary care health center, serving the needs of the homeless and low-income populations of Santa Cruz County. HPHP—run by the County of Santa Cruz—is co-located on the HSC campus, allowing clients who use services at both organizations to more effectively access the resources they need. HPHP staff provide crucial services to residents of the Recuperative Care Center, assessing their medical needs, and providing medical support as needed. Depending on the individual client’s situation, HPHP may be their primary source of medical care throughout their time at RCC. Meanwhile, HSC staff manages the facility, and provides individual case management and housing support to each resident. It is partnerships like these that can make a truly profound difference in the lives of our fellow community members. While both HSC and HPHP provide much-needed services to the community, and each organization’s impact is felt deeply throughout our community, the RCC is a culmination of funding sources and niche services that equates to far more than the sum of its parts. Without a program like the RCC, many of our friends and neighbors would find themselves recovering from a major medical event without the simple necessities of a roof over their head and a safe space to sleep. It is estimated that the average person experiencing homelessness can cost the community $70,000 – $80,000 per year in emergency services, while it costs an estimated $17,000 – $22,000 per year to house that same person. As RCC residents may be more likely to utilize emergency services were they still without shelter, the program has significant financial impact on the community, as well. It is our dream that we can expand the Recuperative Care Center in the future, serving even more of our fellow community members who find themselves in positions of great vulnerability. Community support can help make this happen. And in the meantime, we will continue to nurture the partnerships we have across our many different programs—partnerships that truly change lives.